Recently I spent several weeks traveling throughout Cambodia. My (retired) husband and I signed up for a fifteen-day trek offered by Cambodia Cycling & Trekking. Walking always makes us feel connected to the communities we walk through and gives us a chance to observe life more closely, at a slower pace. Once our Cambodian guide knew that I write children’s books and am interested in schools and teachers, he made a point of taking us into many local schools. 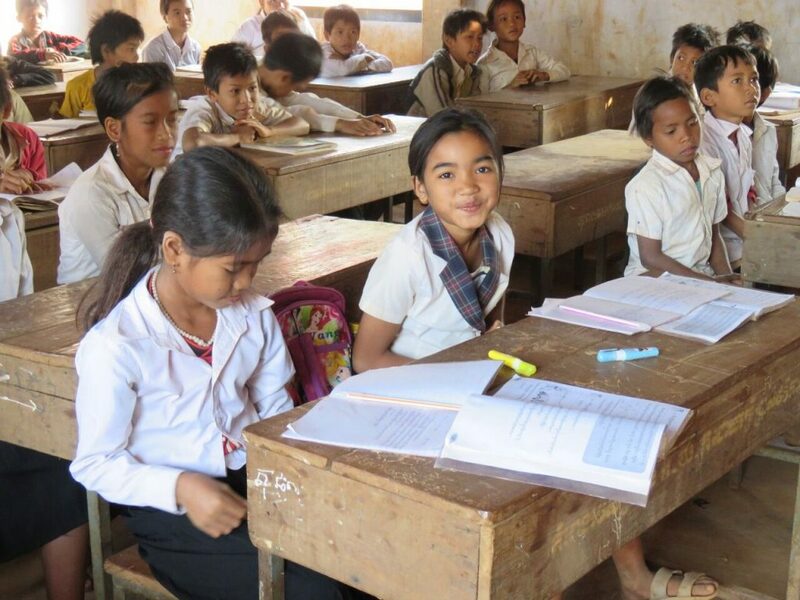 Education in Cambodia is free but children do need to have a school uniform of blue or black pants or skirt and a white shirt. Most of them wear flip-flops to walk to school. Many of the schools we visited offered classes in two sessions: about 200 students came in the morning, another group of 200 attended after lunch. Several schools we visited had signs boasting sponsorship by European or North American NGOs. They also often had drinking water or toilets installed by foreign NGOs. Most of the schools were very bare buildings—a cement rectangle with classrooms in a long row. Each room had a window opening with bars but no glass. Most classrooms had rows of rough wooden desks and a blackboard. We brought piles of children’s books, pencils, pencil sharpeners and some soccer balls we bought in a larger city. At all schools, we found someone who spoke a bit of English. Students in higher grades are learning English and kids everywhere would run up to us, happily chanting “Hello! Hello! Hello!” They often added “Waz-you-name?” without really knowing what they were asking, or waiting for an answer. At the small rural primary school of Koh Trong, an island in the Mekong River, we were welcomed into the first-grade classroom. Within minutes I was given a piece of chalk and asked to write the English alphabet on the blackboard. The kids all chanted out the sounds and many knew the “alphabet song.” Education is incredibly important here. Teachers used to make a pittance and had to have a second job in order to be able to afford teaching. Now it is getting better, we’re told. 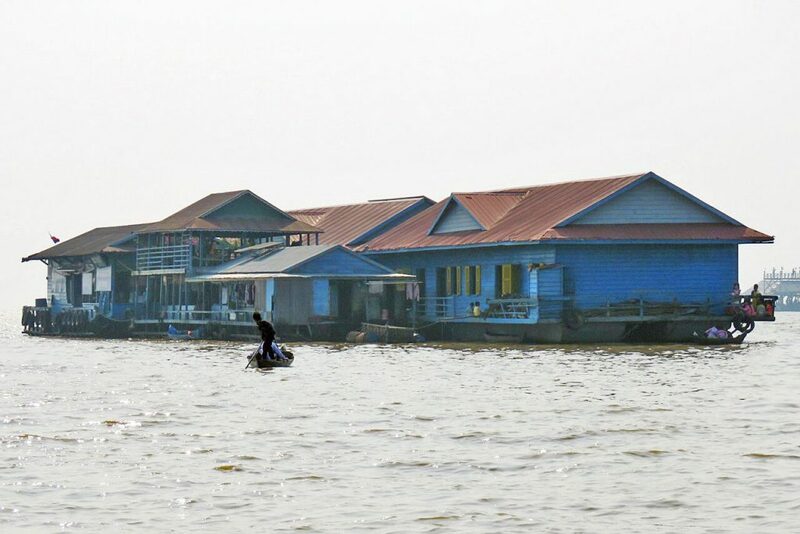 One of the most exciting schools we visited was the floating school of Tonlé Sap, the largest lake in south-east Asia. Some 80,000 people live on the lake and a further three million depend on this lake. Water streams into Tonlé Sap during the rainy season and drains out during the dry season. There’s up to ten metres difference between seasons, so the trees we saw are underwater during the fall. Once we got to the lake, by tuk-tuk, we boarded a long, narrow, wooden boat and made our way to the floating village called Chang Kneas. Years ago I wrote two books, My Librarian is a Camel about unusual, mobile libraries around the world, and My School in the Rain Forest, about unusual schools children attend. The floating school of Tonlé Sap was included in my book, thanks to information and photos from friends who had been there. Now, finally, I had a chance to visit this unique school myself. We climbed into the school, floating and anchored to the lake bottom, and presented the teacher with books and lots of teaching supplies. Of course, I also brought them a copy of the book that features their school. Many of the students here come from original Vietnamese settlers, living in very primitive floating houses anchored to the lake bottom with bamboo poles. The only way they can get to school is to paddle. They do so in anything that floats: wooden boats or plastic tubs. 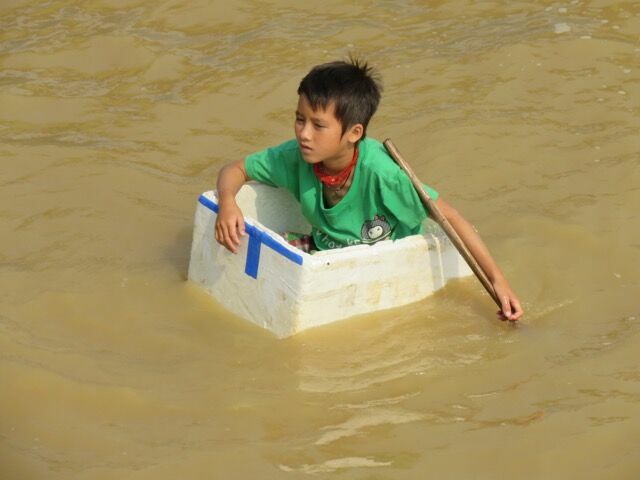 We even saw kids paddling in styrofoam boxes and plastic tubs. Kids in this village learn to swim at a very early age! When I saw online that the itinerary of Cambodia Cycling offered the option of a homestay, I was excited. I thought staying with a local family would be a wonderful way to learn about real life and to meet people. Once we were in the country, I started to worry about a homestay. What kind of house would it be? More like a boutique hotel or truly a local home? The local homes looked very primitive. South of Phnom Penh our car turned into the hills and bumped along smaller and smaller roads until we entered the natural area of Kirirom National Park. Villages were few and far between. Finally we drove into a small village with beautiful, local houses that were well kept and ornately painted. The yards looked swept and tidy. We noticed lots of “homestay” signs on the houses. We drove through the village, past the school and temple compound and into an area where the road ended at some shelters—just roofs sheltering large tables. This turned out to be the “Women’s Restaurant”—a communal kitchen where visitors are fed. From here, we hiked to some lovely waterfalls. Then we were taken back into the village. The Chambok Community Protected Area was established in 2002, facilitated by local authorities, the Kirirom National Parks Department, the Department for Community Research and Development, the Protected Area, the Ministry of Environment, and with the support of Mlup Baitong, UNDP. A German NGO convinced the locals not to cut down any more forest. They were told how they could make a much better income by protecting the environment and inviting tourists to come and spend money. I’m not sure how long it took to convince the people, but now, some 16 years later, the community thrives, the environment is protected, the people have learned diverse skills and host visitors from all over the world. The foundation is strong and, so far, proving to be sustainable. About 300 women now work locally rather than having to go to a nearby city to find work. They grow fruit and produce, taking turns cooking it, cleaning and preparing breakfast, lunch and dinner in the communal kitchen where the visiting tourists come. After dinner of fried pork and pineapple, rice and fried noodles, we went to our homestay. 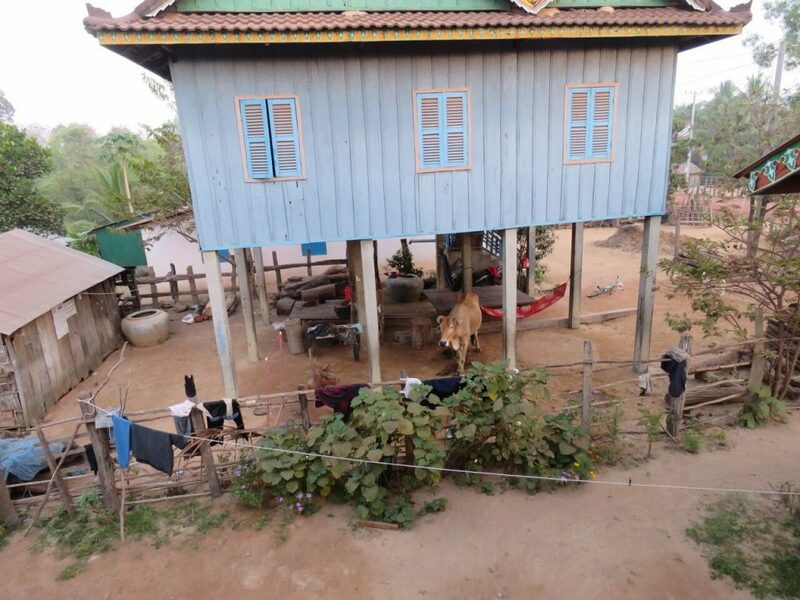 The traditional Cambodian house is built on poles. Underneath is a sitting platform on which a clean mat is spread for visitors. Upstairs is one large room. There is no furniture in the room except for sleeping mats for the entire family and one tiny shelf holding some incense and a cup of water for the house spirit. No pictures on the wall, no decorations. A squat toilet next to the house. The host put a thin foamy and a pillow on the floor but those are only for guests— the locals sleep on the hard floor on a woven wicker mat. We had the room to ourselves and deduced that the family slept downstairs, somewhere, during this night. The families in the village take turns hosting so that they are only displaced a few nights per month but earn money for hosting. The bathroom is a squat toilet with a bucket of water. The kitchen consists of a small wood fire outside on the dirt, with a pot or two simmering. The family’s cow sleeps next to it and is taken back into a field around 5 am. I had expected a night in a village to be peaceful and quiet, but instead it was a cacophony of sounds: barking dogs, crickets, roosters. By 6 am many motorbikes were roaring out of the village, taking the men to their jobs. The women have learned many diverse skills and organize the sales of drinks and food; they make a few crafts to sell and plan meals and host the visitors. They are also learning English. The children all attend school and have the option of English lessons after school, taught by a local volunteer. Like most Cambodian village schools, the school is inside the temple compound. All in all, a very interesting visit, not only to learn about life in a rural Cambodian village, but also to see how a well-run, sustainable project like this can both protect nature and provide a more solid income. The income from the homestays in this Eco Village not only benefits the entire community (they share all income) but also supports very poor families living in the nearby area who are not able to provide enough food for themselves. These people now receive enough rice and staples to help support them.